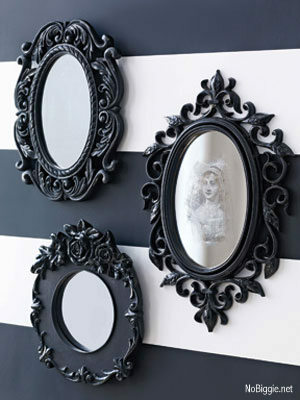 Learn how to make this DIY spooky Halloween mirror with things you probably have around the house. What do you get when we combine an old black and white photo and a mirror? – A spooky mirror for Halloween. I’m not much for the ultra spooky/creepy side of Halloween, so this project is about as far as I go in that direction. I recently bought an old book for another project, and I noticed this old image on the inside and knew that it would be perfect for this project. I also happened to have this little mirror that my grandma had given me a while back. So with these two items in hand, this project was a no brain-er. In fact it was fun to make! Creepy image, right?! 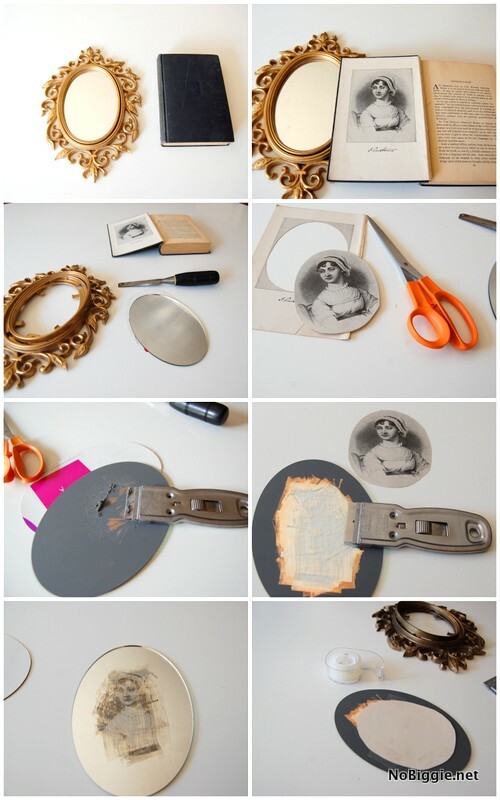 You could also use an old image of an ancestor. Although that might freak your kids out more. 1. Take the mirror apart. 2. Cut out the picture to fit the frame. 3. Scrape off the coating on the back of the mirror. 4. When scrapping try not to scrape off too much. Less is more here. Check it as you go with the picture underneath. 5. See, it looks good here. If I was to do it again, I would scrape a lot less, trying not to scratch too much. 6. Tape the picture to the back of your mirror. 7. 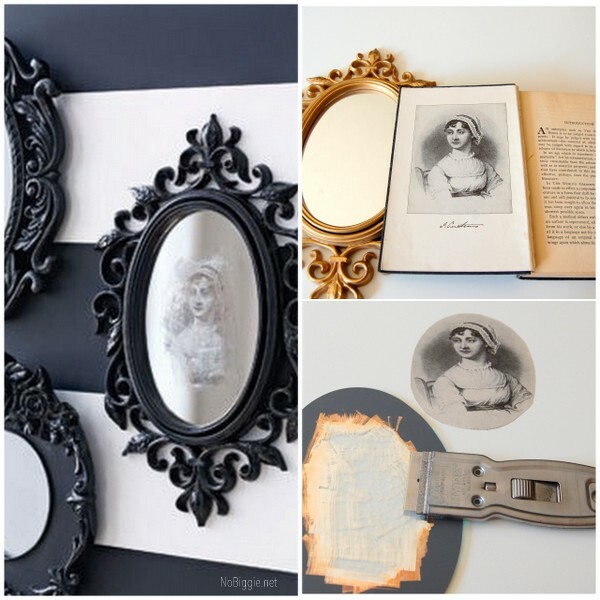 Spray your little frame with black spray paint. Then assemble it all together, and…VOILA!! There you have it! 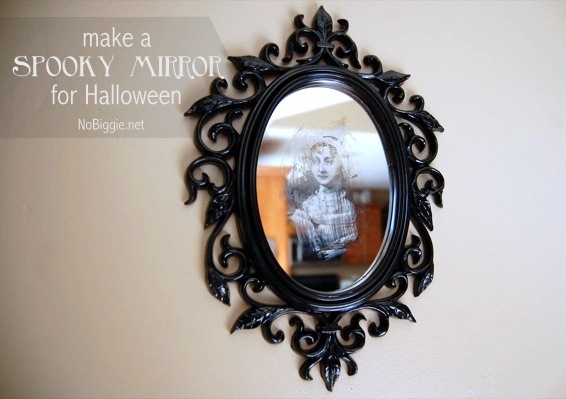 A spooky mirror that you’ll want to keep face down most of the time…or put on your front door. Either way! So, I’d love to know…When it comes to Halloween, are you more into the cute/crafty/whimsical side of it, or the spooky/creepy side of it? Fun News! 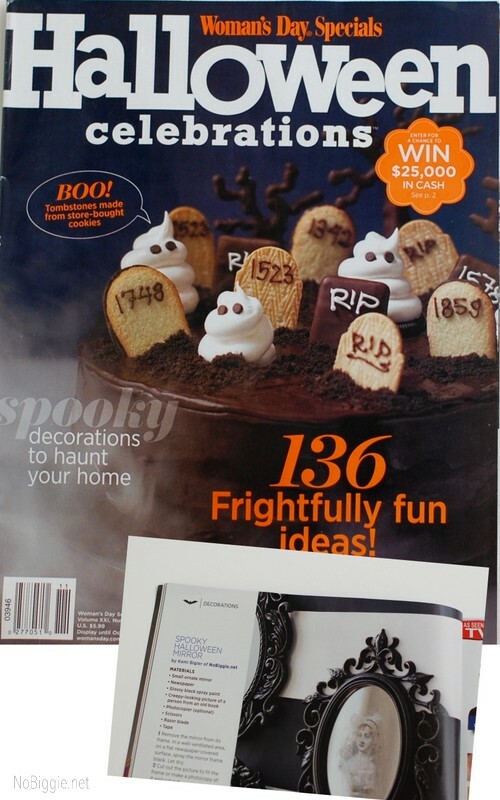 This little Spooky Mirror for Halloween was featured in the Woman’s Day special Halloween Issue! The magazine just hit news stands this season (2011), and they sent me a copy last week. So fun! You can also find it on Woman’s Day online. My friend Cindy of Skip to My Lou was also featured in this issue! They featured her Halloween candy bar covers. So fun!